Former ruckman Rod Galt passed away last week aged just 67. Rod Galt was an enigmatic ruckman who at times showed indications he would become a star. Galt passed away this week at the age of 67 and in modern terms would be described as man who was “out there” in his approach to football and life in general. Originally from local club Beaumaris and Haileybury College, Galt was a tall and fairly thinly-built ruckman whose long arms could haul down spectacular marks. He came through St Kilda’s under-19s at a time when the club was blessed with a number of high-calibre big men. He was set to make his senior debut late in 1970, but had to withdraw from the side at the last minute because of a calf strain. When he made his debut in the opening round of 1971, he stood in for the injured Carl Ditterich and began impressively with a three-goal haul at Geelong. After nailing down a permanent spot from midway through the season, he played in three finals, including the Grand Final against Hawthorn as 19th man. He won the Most Promising Player trophy in an excellent first-up season. With a knack for taking big marks around the ground and an eye for goals, “Spook” put together a strong campaign in 1972, and when Ditterich crossed to Melbourne at the start of 1973, he was seen as the man to take over the ruck mantle. Dominant performances in the first two games, including a five-goal bag against Fitzroy, strengthened the hope that he was a future star. The form wavered briefly and he lost his senior spot, but ended having a solid season which earned him the 1973 trophy for “Most Votes by a Non-contract Player”. His quixotic approach didn’t always sit comfortably with the disciplined style of coach Allan Jeans, and he was sidelined for the last three games for what were described as “committee reasons”. A brief stint playing in Darwin resulted in a knee injury, and at the end of 1975 he was cleared to Carlton. At the age of 24, he was considered a bargain pick-up by the Blues, but with only 11 games in his first three seasons at Princes Park, it looked like his expected impact had failed to materialise. 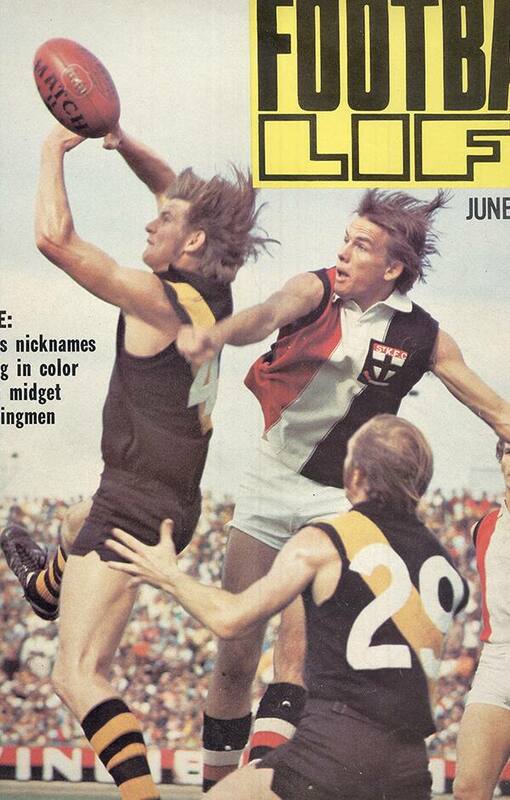 But in 1978 his work as a ruckman/forward lifted to the heights so often expected of him. In 21 games, he booted 48 goals including three bags of six and one of five goals. The rebellious side of Rod Galt came to the fore when he was editor of the VFL Players' Association magazine. A Galt cartoon depicting league officials as pigs with their snouts in the trough raised the ire of Carlton president George Harris. Rod Galt left Carlton at the end of 1979 and had a five-year stint in Adelaide with West Torrens before returning to Victoria and playing with Prahran in the VFA. A lover of the surf, he later founded a highly successful surfwear company. At the company’s peak, Galt made the headlines when he and his wife purchased a $17 million beachfront mansion on the Gold Coast, but the company took a downturn and Galt had to sell the home for $9 million to cover debts. Rod Galt played 77 games and kicked 79 goals for St Kilda from 1971 to 1974, before a further 46 games with Carlton, in which he kicked 100 goals from 1975 to 1979.